1. I was 12, and I’m pretty sure this would have almost been the first time that I was properly aware of the events of 1963. 2. In the same documentary, I discovered that C.S. Lewis had died the same day – a death that was completely overshadowed by events in Dallas. To my 12 year old, Narnia-loving mind, this was a travesty. Over the years, obviously, I heard more and more about the disputed and theorised events of November 22nd, 1963. It became pretty much the only thing I knew about Dallas. 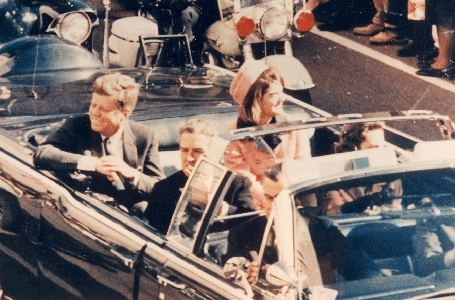 In fact, in 2008 when my Dad visited the city, he sent me a postcard with this famous photograph on it, and a note on the back that “this is still the only thing that Dallas is famous for…”. The heritage sign outside the museum – note the underlining of ‘allegedly’. To be honest, I’m not a great one for theorising. The fact remains that JFK was killed and the world had to find a way to move on from that point. But, it turns out that pretty much everyone you talk to has a different theory on why he was killed – and these range from possibly illogical, to virtually insane. No one will ever know the reasons behind the assassination, but that doesn’t mean that people will stop trying to find out! The museum is worth a visit – I was surprised at how anxious I became as the chronology moved towards the shooting. But I got bored with the long section at the end about the various Commissions and rehashing of evidence. It’s also very protective of the windows in question, you’re not allowed to take photos at all on the 6th floor, which of course only fuels speculation further. I had a much better view from over the road! X marks the spot on the route of the motorcade. Not because I feel the need to be reminded of the events of 22nd November 1963 every day – but because in the photo, you can see the window that the Matroyshka Haus desk is next to. 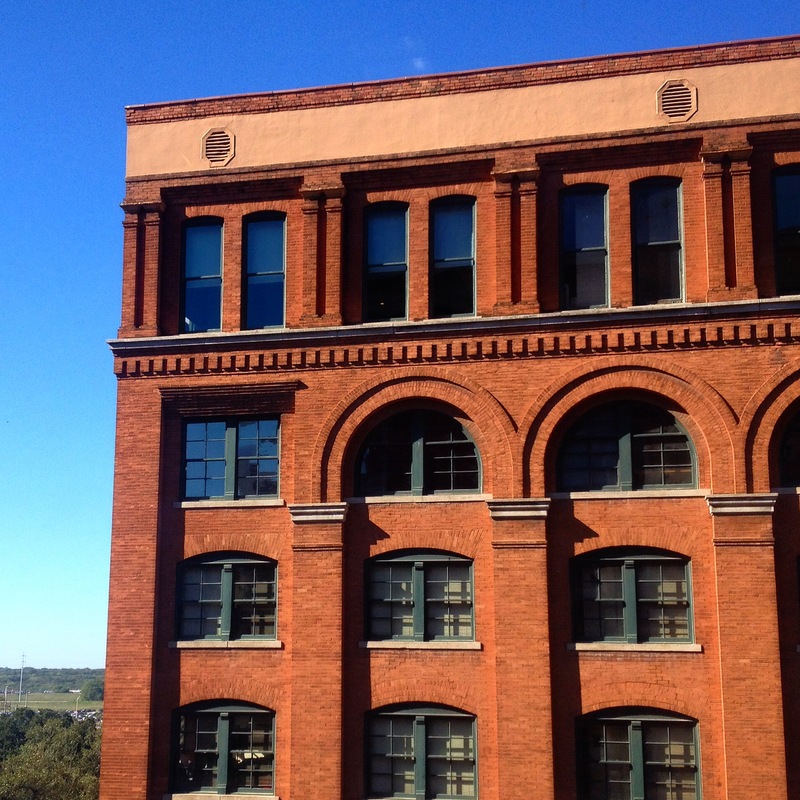 The building across the street from the book depository is unchanged, save for the loss of a fire escape, and if you count four floors up (where ground = 1) on the side adjacent to the depository, you find ‘our’ window. Incidentally, PLEASE could the UK get voting stickers?? They’re such a good idea! I love a bit of American political geekery. It’s potentially an odd fascination for a Brit to have (especially as it was fostered pre-West Wing), but it’s largely thanks to lessons on the War of Independence during a summer in Boston aged 10, and half the syllabus of my Government & Politics A-level. [And the fact that aforementioned syllabus was taught by a young and – in a girls’ school context – attractive male teacher who was passionate about the subject.] As that A-level was studied during a period of time that saw Clinton’s near impeachment, it easily became the most exciting subject I studied in school. To be honest, I hadn’t anticipated that politics would become such a significant theme on this trip. Yes, I expected a certain amount of political discussion and cross-cultural engagement between the politics of Texans versus a tribe of leftie Londoners – that’s one of the joys of building relationships there. 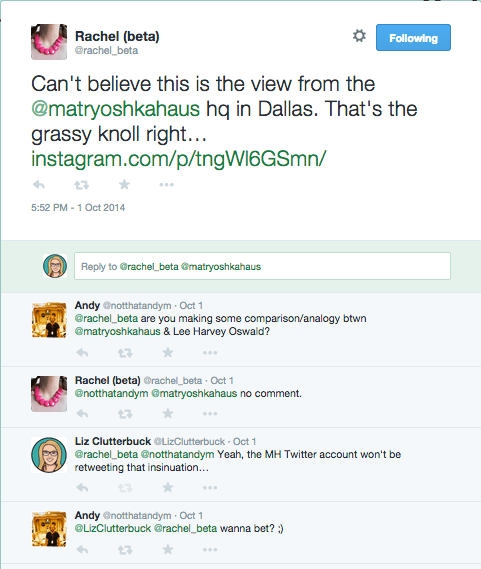 Yes, I knew that I’d definitely be visiting the site of JFK’s assassination – because Matryoshka Haus’ new Dallas workspace looks out over it. But did I expect a full on geek out at Presidential libraries and government buildings? No! 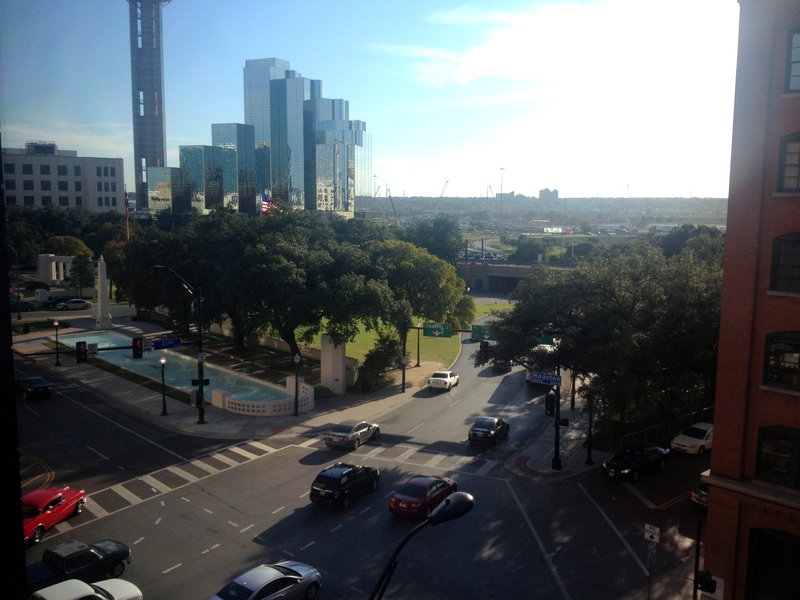 Looking back, it seems the tone for the trip was set on my very first day in Houston. Saturday morning saw me sitting in a cool church building watching an educational theatre troupe perform an account of the founding of the USA. Because nothing says “welcome to America” like an hour of hearing just how terrible the British were!! Hours later, I attended a dinner party in honour of the Brits, featuring a menu designed to honour the War of Independence. In retaliation to one British jibe, I shared the conclusion of an essay I’d written for my Imperial History MA in which I’d argued that if we hadn’t got rid of the 13 colonies, the British Empire wouldn’t have been the force it was… Never mess with an Imperial Historian! 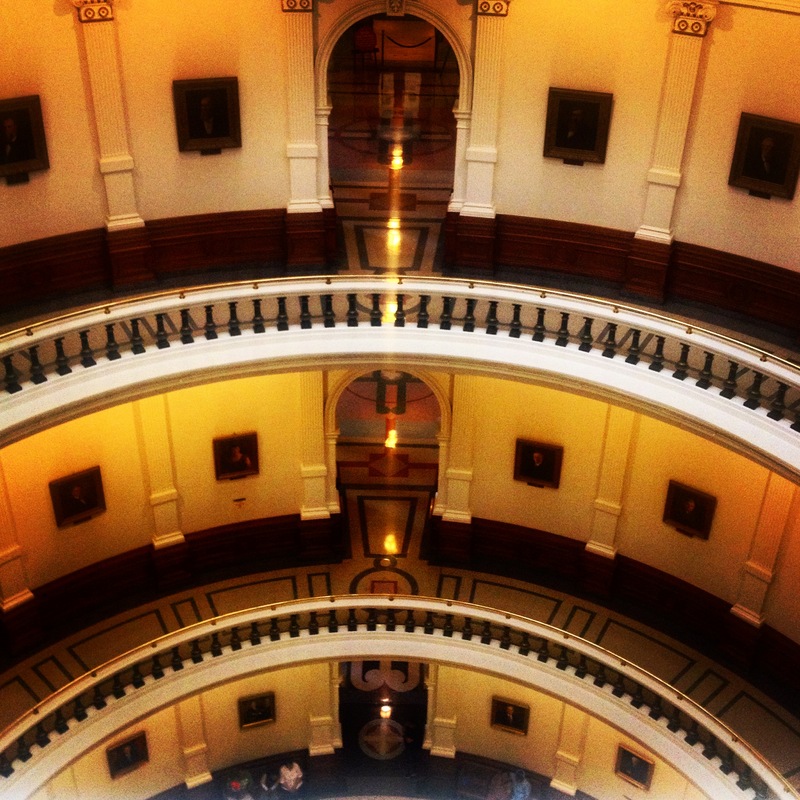 The Texas Capitol looks a little similar to the Federal one, but is shiny & pink. 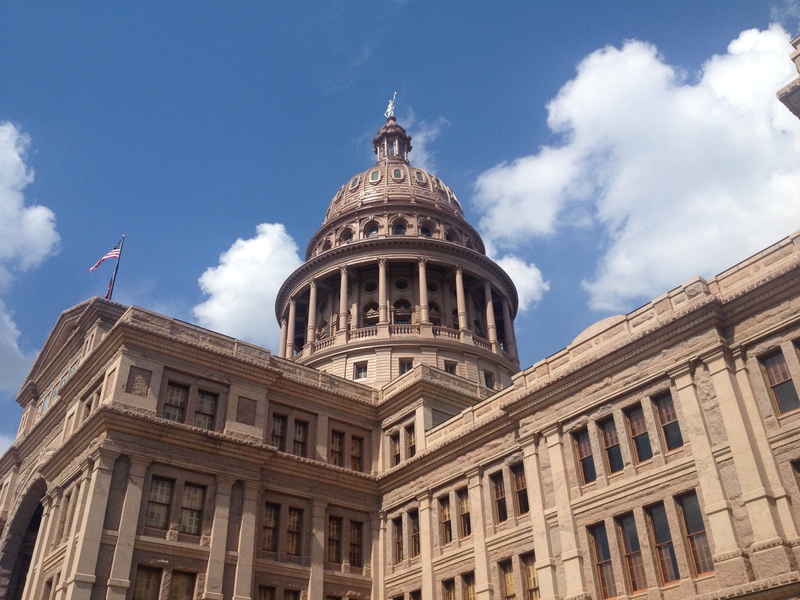 Somehow, upon arriving in Austin, a trip to the capitol building was placed on our itinerary. [Didn’t know Austin was the capital of Texas? Clearly you need these educational cookies!] We had a slightly more cynical tour guide than the official ones (God bless our wonderful Austin friends who make us Brits feel at home with their irony and sarcasm), who nonetheless covered a decent amount of Texan history and put it into the context of the current election. 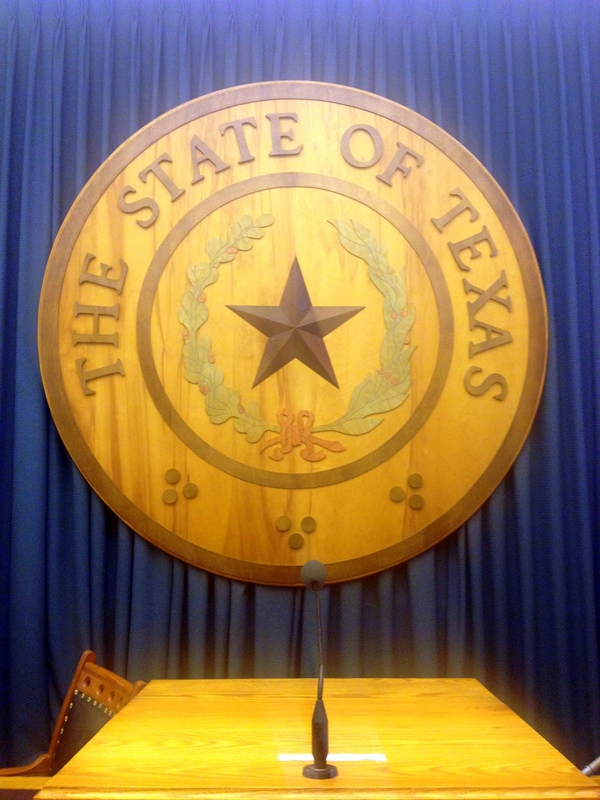 For example, did you know that there have only been two previous female governors of Texas? [Miriam A. Ferguson, 1925-27 & 1933-35 and Ann Richards, 1991-95 – both were Democrats.] 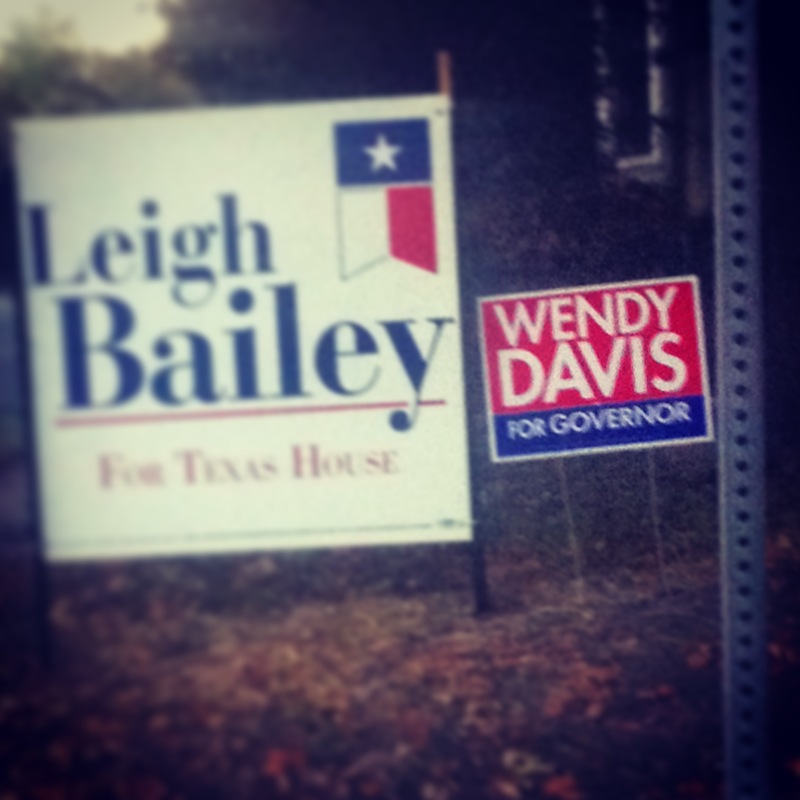 Today, Wendy Davis (the epic Wendy Davis who taught a new generation the meaning of the word ‘filibuster’) is in the running to be the third. Happily, we were able to explore most of the building at leisure, including the House of Representatives – election season meant that little state business was on the agenda. The press room, where I may have had a bit of a CJ moment behind the mic. To be honest, I’d have been happy if the political geekery had ended there! 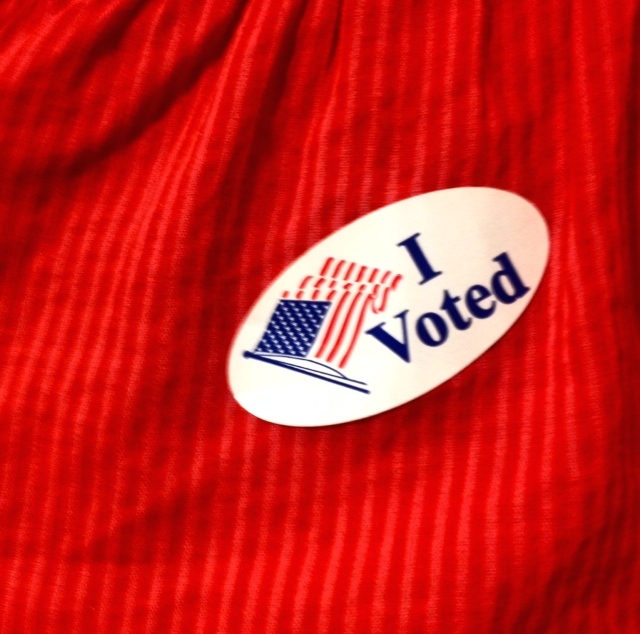 I’m not one to impose my political geekery upon others and I’m sure there are lots of things we could have done the following morning, left to our own devices in Austin. 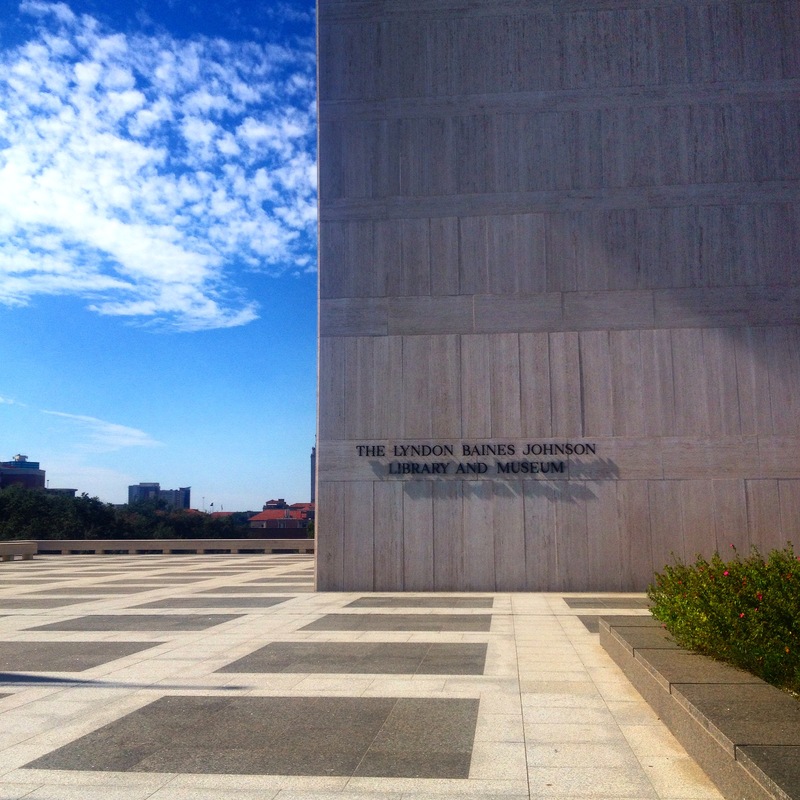 But when one of my travelling companions suggested the LBJ library, it seemed churlish not to approve this idea enthusiastically! 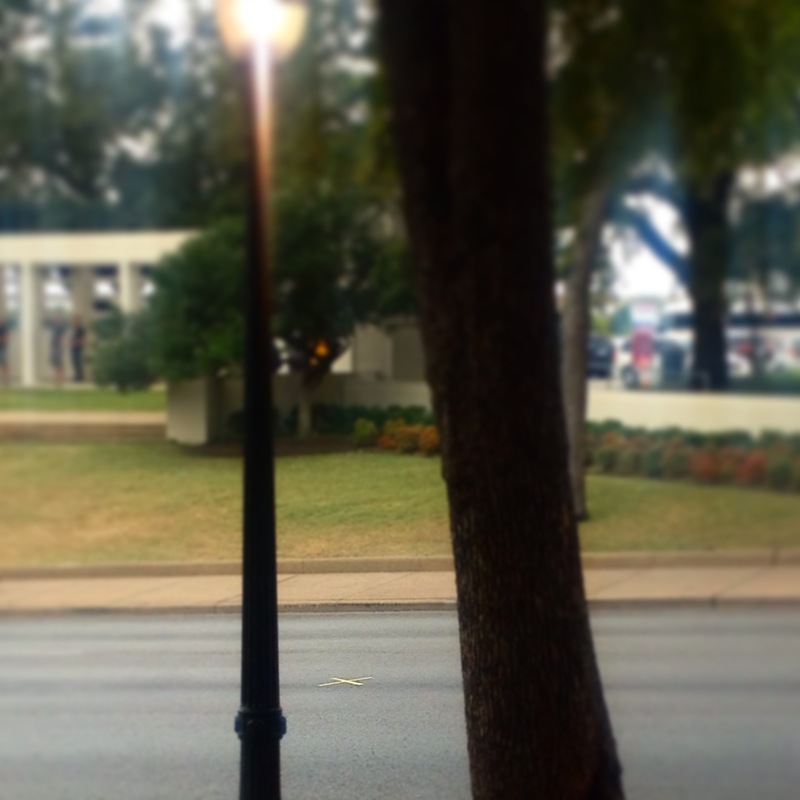 Given that our next destination was Dallas, it felt appropriate to experience the LBJ Presidency knowing that we’d soon visit the point it at which it had begun. All three of us left the museum with a new level of respect for him, and a lot of questions about other Presidential libraries. Presumably they all did a propaganda job on that presidency? Was there a library for William Henry Harrison (who died a month after catching pneumonia at his inauguration)? [Answer: no, because the system only began with Hoover and only ‘significant’ previous presidents have been added.] 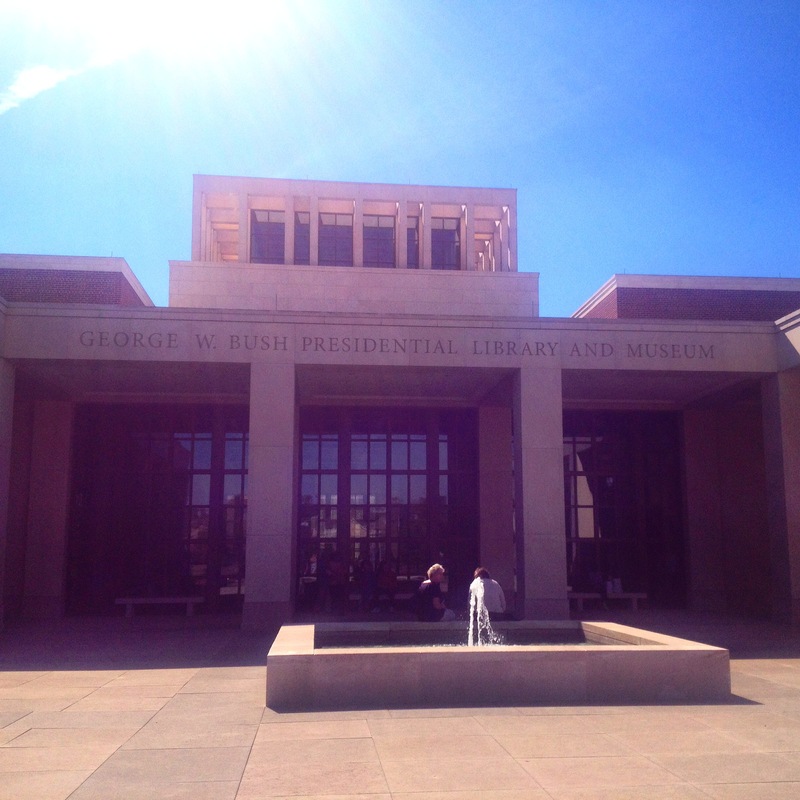 And, what on earth was the George W. Bush library like?? 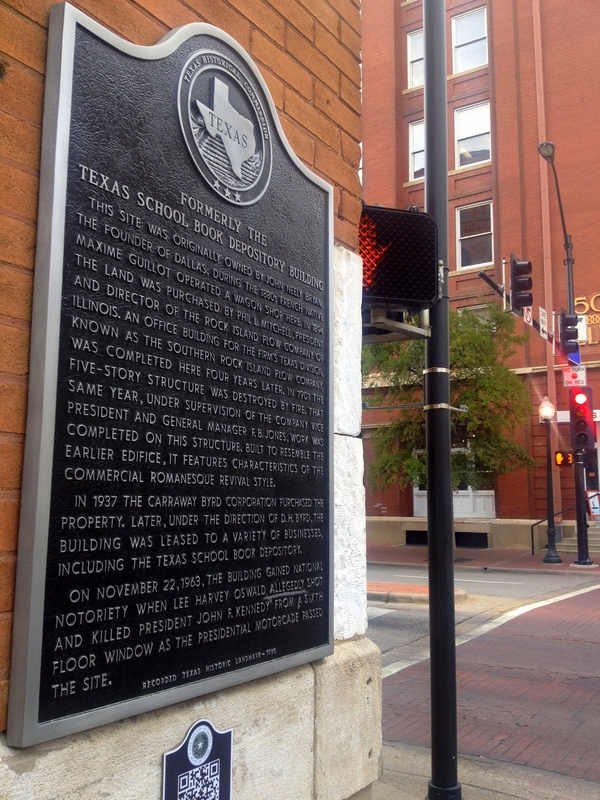 The last question was, in theory, easy to answer given as it stands on the Southern Methodist University (SMU to locals – and daughters of theological college principals who have spent a month there…) campus in Dallas. The rest of the British contingent had left Texas by the time I got a chance to visit it and unfortunately, I still can’t really answer our question. I came, I saw the outside of the building and I browsed the gift shop. I didn’t choose to go past the airport style security (including liquid restrictions!) that preceded the ticket office. To be honest, I felt incredibly uncomfortably the entire time I was there. Travelling in election season brings these differences to the fore. While having a pedicure one afternoon, I watched a number of political ads on the local news channel. Party Political Broadcasts they were not! No careful unpicking of the opposition’s manifesto, just straight out attacks on the other candidates – like a Republican ad arguing that electing Davis would be tantamount to electing Obama (and that that would be a bad thing). On my final evening, we went out for tacos at a place that happened to have political themed tacos (I know!!). I went for the Democrat, owing to its inclusion of beef & cilantro, and observed it happened to be 20c pricier than any of the others. “Of course!” my host replied, “everything’s more expensive under a Democratic administration!” We laughed. This is why I love travelling the way I do. I don’t hide in sterile hotels that are the same the world over, I experience life the way locals live it. I ask lots of questions along the way, and get lots in return too. Life would be very dull if we were all the same – it’s the differences that makes things interesting! As a professed London Transport nerd, I do take a peculiar joy in experiencing public transportation elsewhere in the world. 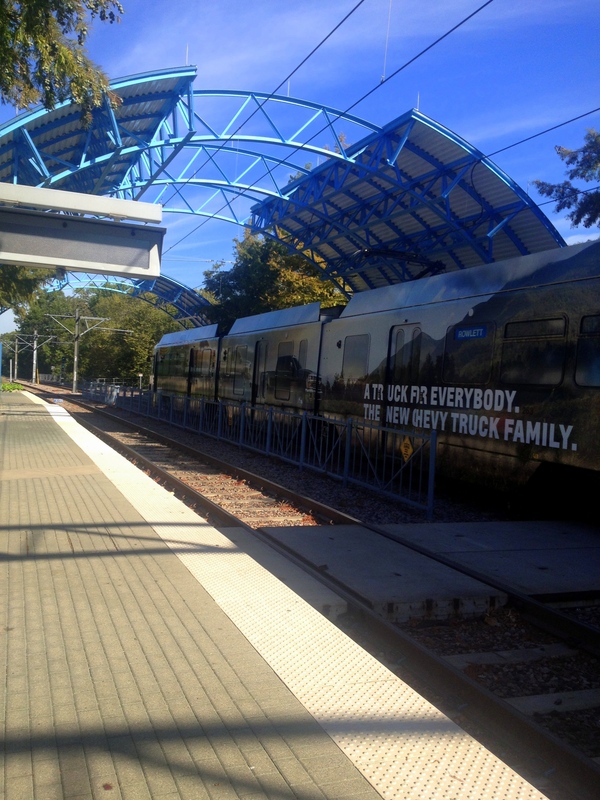 Thus far in my Texan adventures (across 2012 and this most recent trip) I’d yet to encounter any public transport at all – but this changed in Dallas. 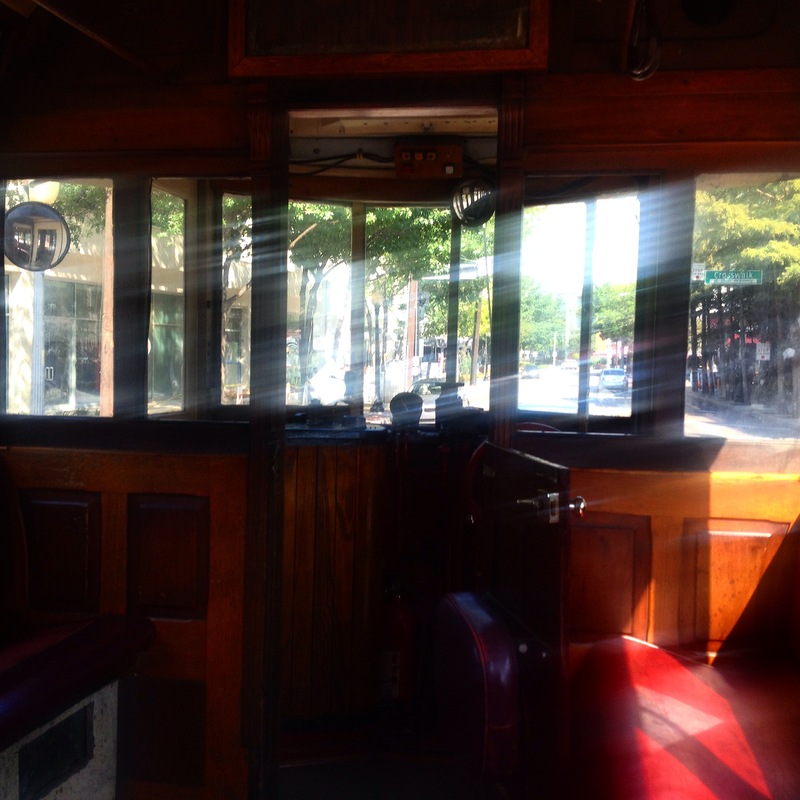 My only experience of the McKinney trolley was on Matilda – who formerly graced the streets of Melbourne. 2. 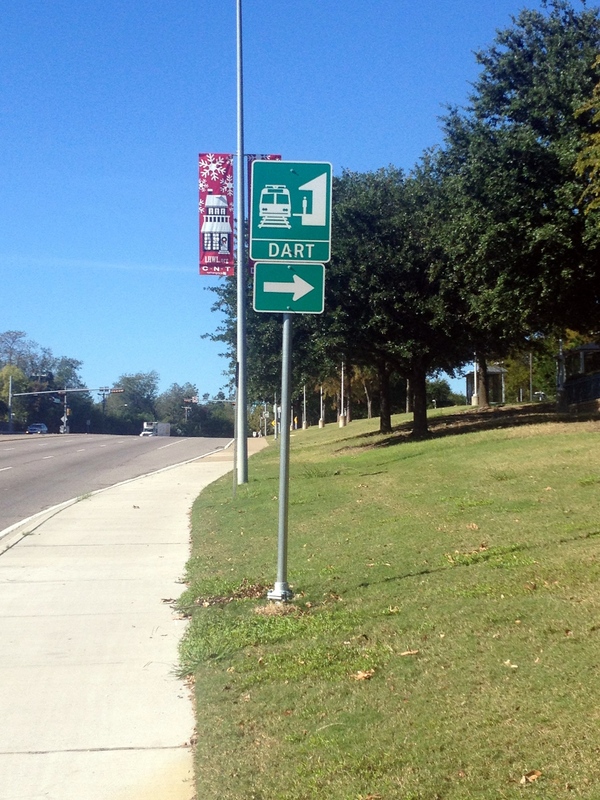 The main DART network is easy enough to navigate and is good value at $2.50 for a two-hour ticket or $5 for an all-day one. Plus, you can download an app on your phone that you can use instead of a paper ticket and use to buy monthly tickets. There are no ticket barriers, but inspectors are frequent – I was checked on at least half my journeys. 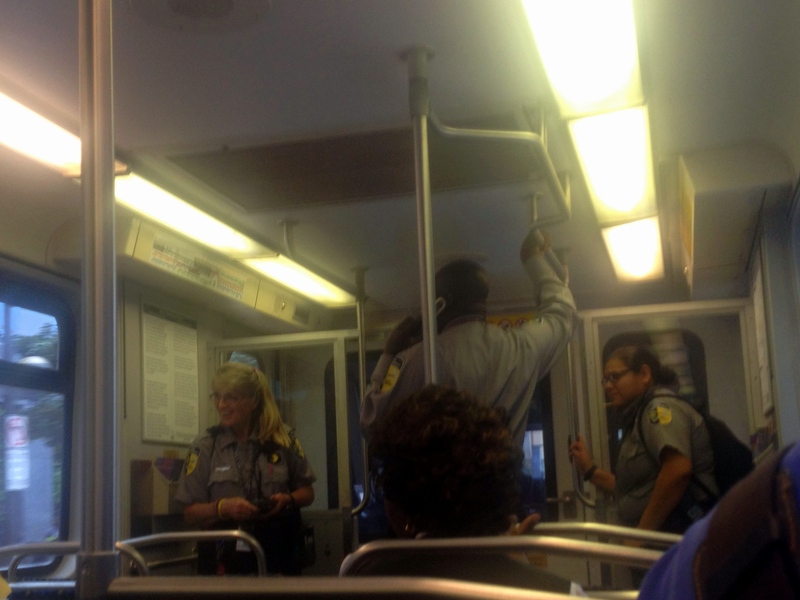 A flurry of DART inspectors all in one carriage. 3. 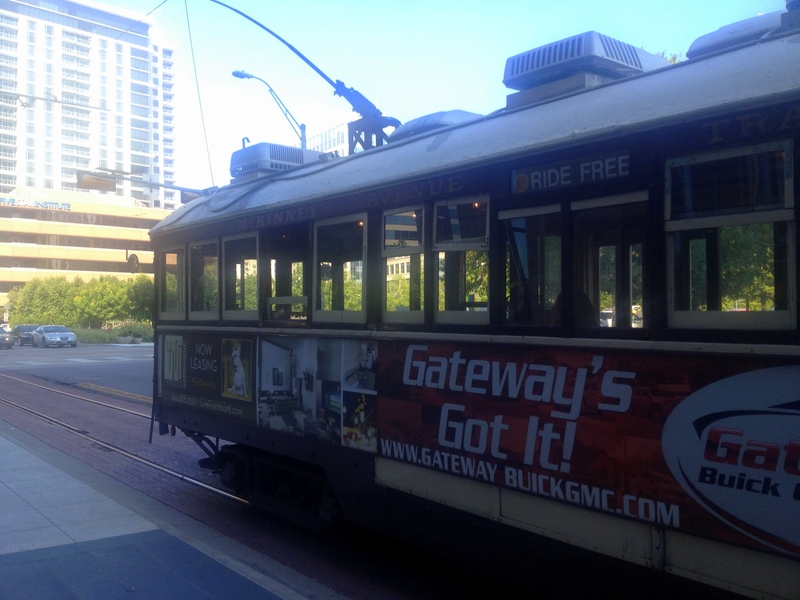 The DART is effectively a glorified trolley service, running along streets in the Downtown area of Dallas. [Liz’s irrational fear #453: that while crossing a trolley-bus dedicated street, a trolley-bus will appear as soon as she steps onto the tarmac, mowing her down.] 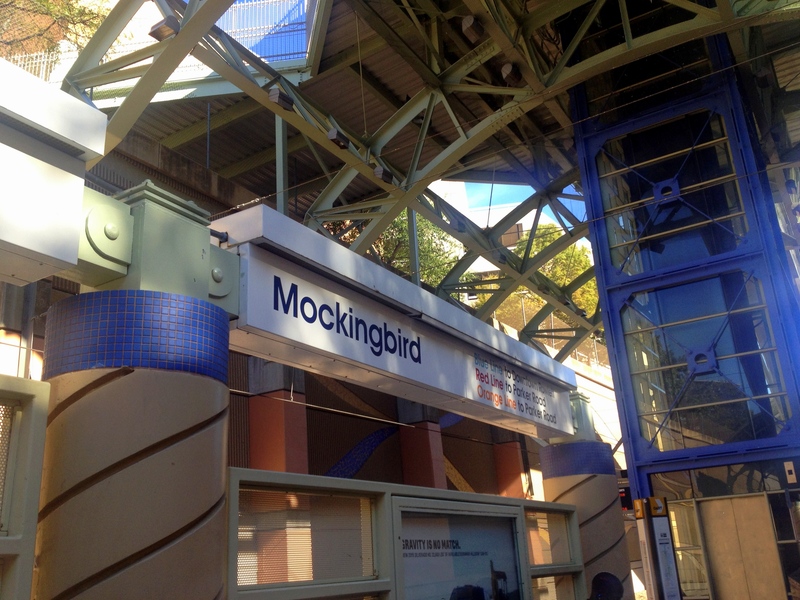 This means that it’s very easy to see where you are; where to get off; and how to find the train – none of this wandering around underground tunnels and navigating staircases. 4. 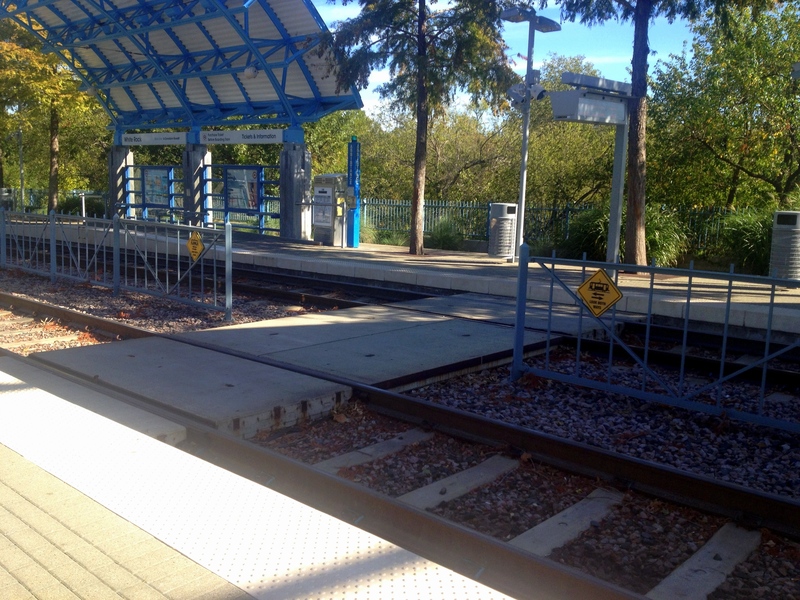 I was pleasantly surprised that the family with whom I was staying were within easy reach of a DART station – and used it. Admittedly, the pleasant 1 mile walk from their house to the station had a minimal quantity of sidewalk, but it did pass through some glorious countryside. The line took me straight into the city and took under 20 minutes. Beautiful. 5. But, just because some people I knew used the DART, like most of my experiences of American public transport (NYC excluded) the vast majority of passengers were those who could not afford cars, and used public transit out of necessity not choice. I used it one evening and wasn’t entirely sure that I should have – in fact a rather lovely female ticket inspector spent a long time chatting to me in what appeared to be an effort to make the only white woman in the carriage feel safe. [I didn’t feel unsafe – just aware that I was conspicuous, something that in London can be unsafe.] In fact, I came across the same woman the next morning – she’s the white haired one in the above photo of the many inspectors on one train. 6. My illogical fear of crossing the DART lines was exacerbated by the fact that it was the main way of reaching the correct platform. I had no desire to become strawberry jam on the tracks of a suburban station! If the DART ever visited London, I think it would feel hard done by. Ultimately though, the DART really is not to be sniffed at. Public transport is rare in a state where the car is king (and the jeep is emperor), so finding a system that works is somewhat miraculous. As of this August, it also now goes out to the airport (I know, they took their time! ), which is exceptionally useful. It helped me be almost as self-sufficient as I like to be in London and that means a lot on a trip that lasted two full weeks and might otherwise have driven an introvert to distraction! Adventures in Texas continue. There has been a lot of work and even more fun (the main event I’ve been working on happened on Thursday, so prep and follow up is keeping me busy in amongst the fun). One exceedingly excellent element of fun was a night living the suburban American dream. A night engaged in a truly all-American activity. An evening of almost incomprehensible entertainment. 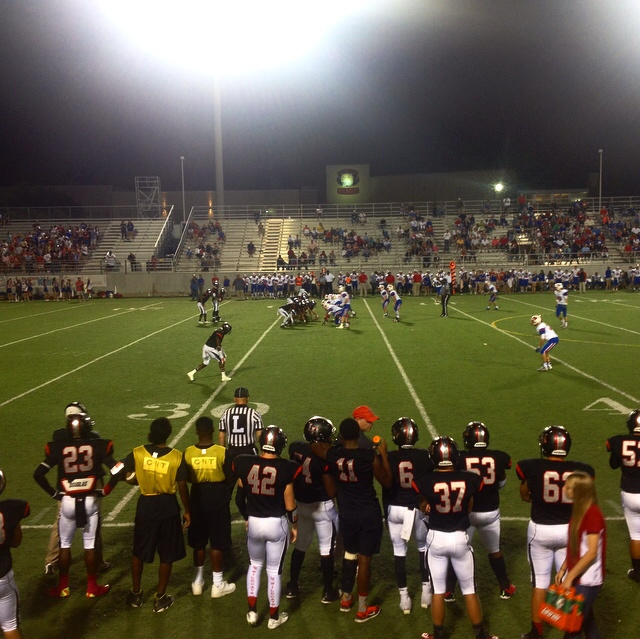 My very, very first High School Football game. 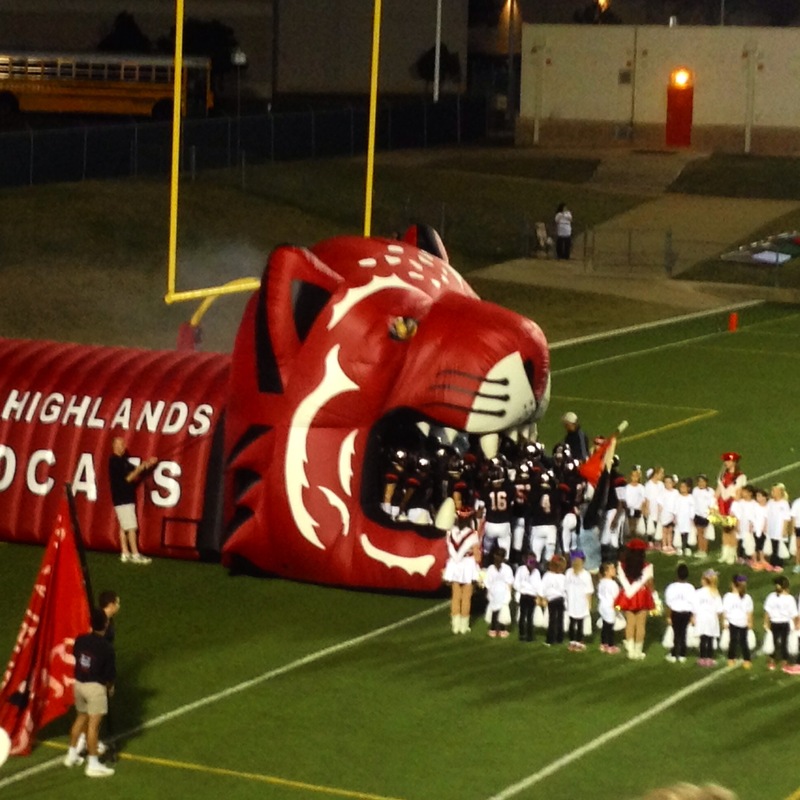 The Wildcats join the field. En route to the game, struggling to find anyone who could explain the rules of football to me, I asked whether it was anything like Quidditch. The car, en masse, laughed at me – yet, after an hour in the stadium it was clear that actually, it wasn’t that far fetched a question. For a start, like Hogwarts’ favourite sport, football contains myriad terms that make absolutely no sense to the outsider. Quaffles and quarterbacks; bludgers and buttonhooks; snitches and scrimmages…I could go on for quite a while. The goal pole thingys are really quite similar. Admittedly, football doesn’t involve hoops, but they look more Quidditch-y than soccer goals. There are people wearing peculiar clothing. Various members of the band wore tartan sashes (I didn’t ask) or sequinned ones, over their black uniforms that were distinctly robe-like. 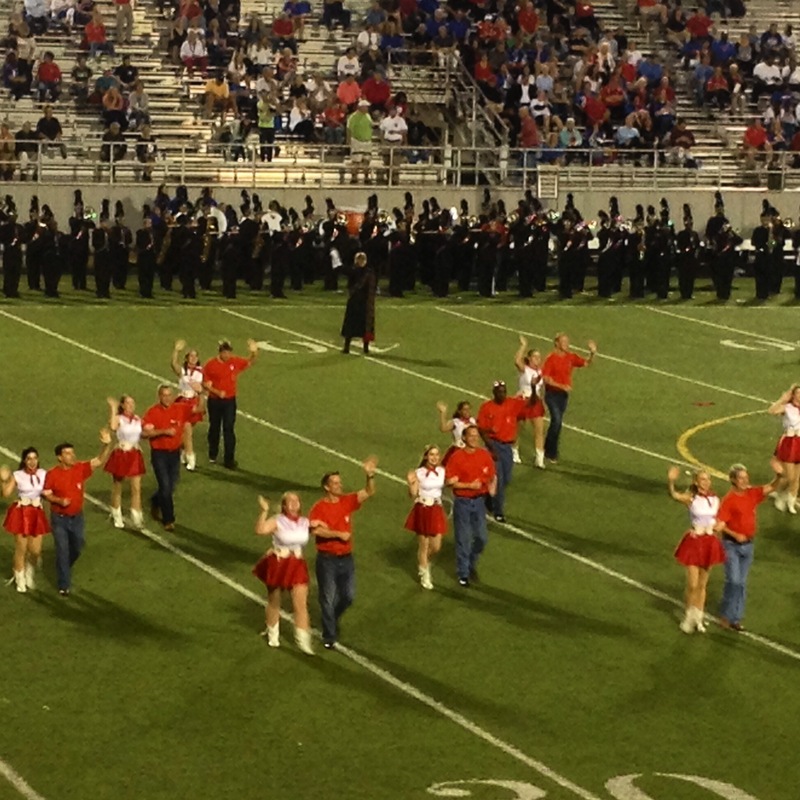 The drill team wore short white cowboy boots and sequinned cowboy hats (plus clothes in between, obviously). Even the crowd was bedecked in the school colours of red, black and white. Then, there was the coordinated movement – not so much on the pitch, but before, during and after the sport. The drill team’s display (I have learnt the important difference between drill team and cheerleaders) was as bewitching as a Veela’s dance – especially as it was special ‘Daddy-Daughter day’ and their fathers danced with them. At one point, an entire section of the crowd performed some routine they’d been working on for some time. It was weirdly impressive. Every team’s band has a routine that they’ve worked on all summer, ready for the autumn football season. There are sectional, regional, state and national competitions (terminology that is familiar to those who have watched Glee – what works for glee clubs also appears to work for marching bands). Members rise up the ranks, only achieving significant positions when deemed good enough. The musical standard is exceptionally high, but so is the requirement for being able to move in a coordinated fashion. It was all I could do as a student to play my clarinet moderately well, while seated on a wooden chair – had marching and dancing been added into the mix, all clarinet playing ability would have vanished! 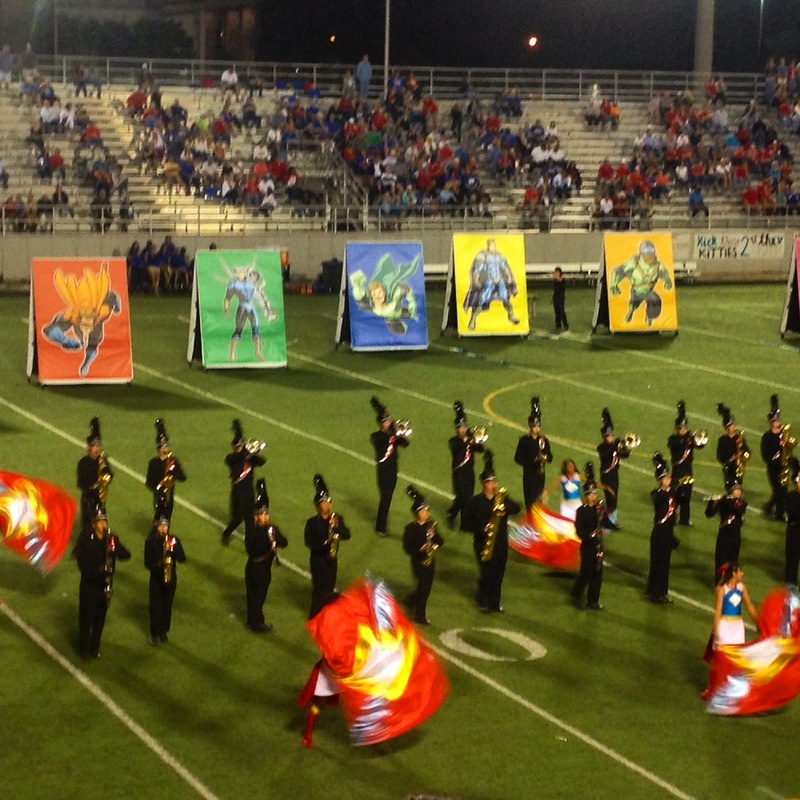 Oh, and the routines have themes! The opposing team on Friday night did one involving gondolas and Venetian canals (no, I have no idea either). ‘Our’ team, on the other hand, had a rather wonderful Superheroes number – complete with Wonderwoman themed flag wavers (I forget their correct name). It was a ridiculous response! I am not a teenager in High School. I’m not even American. For me, the American dream is just that – a dream. But sometimes it’s nice to pretend that’s not the case for a few hours. As of yesterday (or rather, the day before yesterday as it’s currently 5am UK time…) I’m in Texas for 2 weeks of work, rest and play. It’s a little bit different to my last trip two years ago – fewer dips in rivers and drinking frozen cocktails and a bit more actual work. Plus, it’s ‘fall’ and the locals aren’t frequenting the rivers so much. It’s bizarre being somewhere so hot in October – but it shouldn’t be. Obviously, Texas in October was still going to be on the warm side. Today’s temperature was 88F (31C), dropping to around 60F in the evening. Yet, in Gap and Target the rails were full of lovely winter coats, jumpers and cardigans. As three Brits rushed around Target, it was clear that we were the only ones exclaiming over chunky knitwear and woolly hats. I picked up three pairs of over the knee cosy socks – from a choice of about 12 – and pondered who on earth they thought would buy any of this stuff? Then there’s all the ‘Fall’ merchandise: the accessories, decorations and abundance of pumpkins. All in the reds, browns and oranges of turning leaves – except the leaves aren’t turning here. Who needs a Pumpkin Spice Latte in weather that’s the equivalent of a London heatwave? Of course, it’s all perspective. As we landed in Atlanta [incidentally, do all you can to avoid changing flights there, it’s another circle of hell] the pilot informed us that “it’s a perfect fall day with a temperature of around 80 degrees”. A temperature of 27C in the UK would be a balmy, fabulous summers day to be spent in as little clothing as possible, probably drinking beer. While having my nails done this morning, a fellow customer commented on wanting a “fall colour” given that it was going to be “so cold” that evening. A couple of weeks ago, while the UK was having a freakishly fabulous Indian Summer, it was easy to spot the tourists in London because they were the ones wearing hats and coats, while the locals kept their flip-flops in use for as long as possible. Temperature is all relative. To be honest, I’m not complaining. I’ve got a bonus two weeks of summer and tomorrow morning I have the option of a Sunday morning outdoor swim. 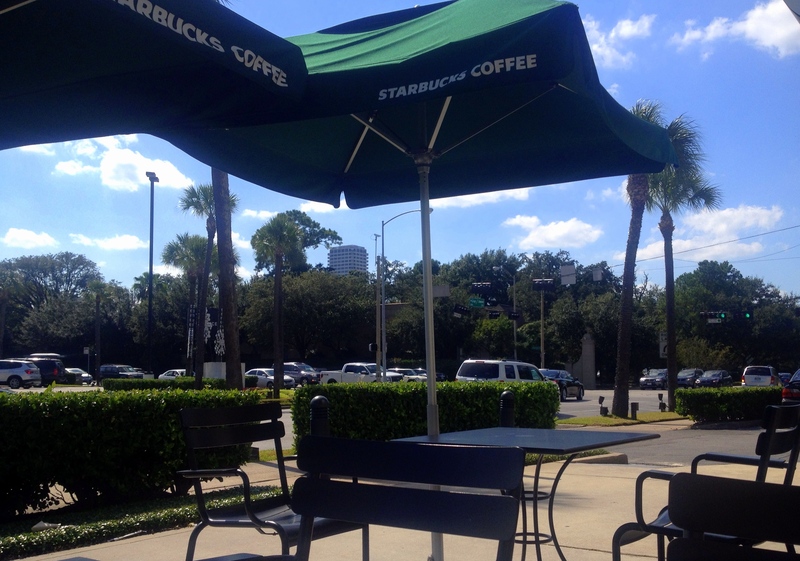 Blue skies, palm trees & iced tea. Note: no one else is sitting outside.